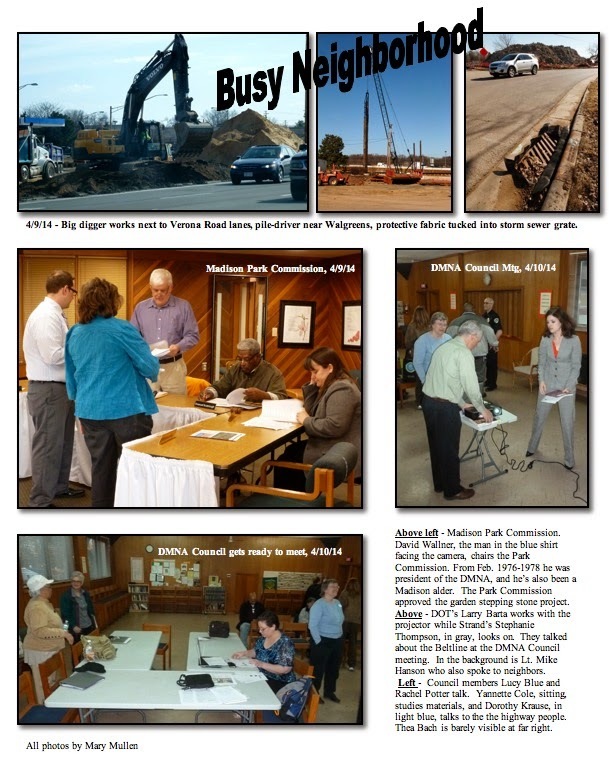 SPRING THINGS: Easter Egg Hunt, Dunn’s Marsh litter pick up, garden plots (Articles 2-6 & 8); NEIGHBORHOOD NEWS (Articles 7-16); Lots of PHOTO COLLAGES. Thur., May 8 - 7 p.m. - DMNA Council Meeting, Prairie UU Society, 2010 Whenona Dr.
Prairie Unitarian Universalist Society will host their 4th annual Easter egg hunt on Sunday, April 20th starting at 10:15 until 11:15. Toddlers through 6th grade are asked to bring a basket or bag and meet outside the building located at 2010 Whenona Drive. After the egg hunt there will be games and crafts. For more information, contact Rebecca Malke at dre@uuprairie.org. Looking for a way to get outdoors and celebrate spring? Try participating in a neighborhood clean-up. Dunn’s Marsh Waterway Cleanup - 9:00 a.m., Sat., April 19. Meet at Apache Pond, Crescent Road. Belmar Park Cleanup - Sat., April 19. Unknown time, probably morning. Meet at Belmar Park, corner of Red Arrow Trail and Jenewein Rd. Wouldn’t it be nice if someone picked up that shocking amount of litter that’s collected along the Beltline Frontage Road through the winter and spring? We haven’t organized anything, but some angel or angels could take it upon themselves to gather their heavy duty garbage bags and do the job. Why not get together with a civic-minded neighbor, and spend an hour cleaning up that disgusting mess? If you plan to do this, take your camera along to document before and after, the bags you filled, and the people who did the work. Send them for publication in this newsletter. If you pick up the litter, please sort into two categories - recyclables and trash. Glass or plastic liquor, beer, and soft drink containers are recyclable and should go into your recycling barrel. Almost everything else is trash and should end up in your trash barrel that goes to the landfill. After a long winter under a deep blanket of snow, your lawn is finally visible again, matted and brown. You may be thinking about spring cleaning and maintenance, including an application of fertilizer to ensure lush, green grass this summer. Before you fertilize, test your soil to see what your lawn needs. You may be wasting your time and money, and sending excess nutrients to local waterways where they feed algae and damage fish habitat, if you don’t test first. If your soil already has the right balance of nitrogen, phosphorous and potassium, you don’t need to fertilize. To figure out your lawn’s needs, send in a soil sample to be tested. The University of Wisconsin has a soil testing lab right in Madison. Any Wisconsin soil can be submitted for analysis at a cost of $15/sample. A sample is two cups of soil collected in multiple places from the top 4 inches of your lawn. The laboratory will return a report for each sample indicating soil pH, percent organic matter, phosphorus and potassium analysis. It will also provide recommendations on the addition of lime (for pH) and fertilizer. Right now is a great time to test—you should have your results in time for a spring application, if one is recommended. You’ll find everything you need on the UW soil lab website http://uwlab.soils.wisc.edu/lawn-garden/ (or google “UW soil testing”), including the submission form and sampling instructions. The Madison Area Municipal Storm Water Partnership is working with the Rock River Stormwater Group to reduce the amount of pollution making its way to our lakes and rivers. The Yahara chain of lakes and the Yahara River both ultimately drain to the Rock River. Both groups thank you for helping to Renew the Rock by reducing stormwater pollution throughout the Rock River area. Learn more at www.myfairlakes.com <http://www.myfairlakes.com> and www.renewtherock.com <http://www.renewtherock.com> . Warmer weather has finally arrived, and with it, the unofficial ritual of de-cluttering closets, basements, garages, and barns to start off fresh. Thankfully the county’s new Clean Sweep facility, now operating year-round instead of a limited time during the year, is making it even easier to get rid of the old paint, car batteries, or unwanted electronics like computers and cellphones you may have piling up. Clean Sweep first opened two decades ago, and the program has kept an amazing 10 million pounds of waste from filling up the landfill or being disposed of in unsafe ways that pollute our water and soil. Our new year-round facility opened last year at the county’s landfill, and has increased hazardous waste collection throughout the county by 3% percent – an amazing 764,939 pounds – resulting in even less pollution entering our water and our soil. Electronic waste collection, a new addition to Clean Sweep, has also been successful – 57,477 pounds, or enough to fill 3 semi-trailers, of unwanted electronics were kept out of the landfill in the first year. Making the change to a year-round Clean Sweep program not only helps tidy houses, businesses, and farms, it’s part of the county’s overall commitment to a sustainable and energy efficient future. We’re making homegrown bio compressed natural gas from decaying trash at our landfill and using it to fuel our county vehicles; helping build manure digesters that clean up our lakes and reduce greenhouse gas emissions; and updating county facilities to save energy and taxpayer dollars. We hope you’ll visit Clean Sweep at its new location at the county landfill (7102 US Hwy 12, Madison), Tuesdays – Fridays from 7:00am - 2:45pm, or Saturdays from 8:00am - 10:45am. Clean Sweep will be closed Sundays, Mondays and Holidays. Dane County households will be asked to pay $10 per drop-off. Please call 608-838-9555 or visit www.danecountycleansweep.com <http://www.danecountycleansweep.com> for additional details, including a full description of products and electronics that will be accepted, fee structure, and exceptions. 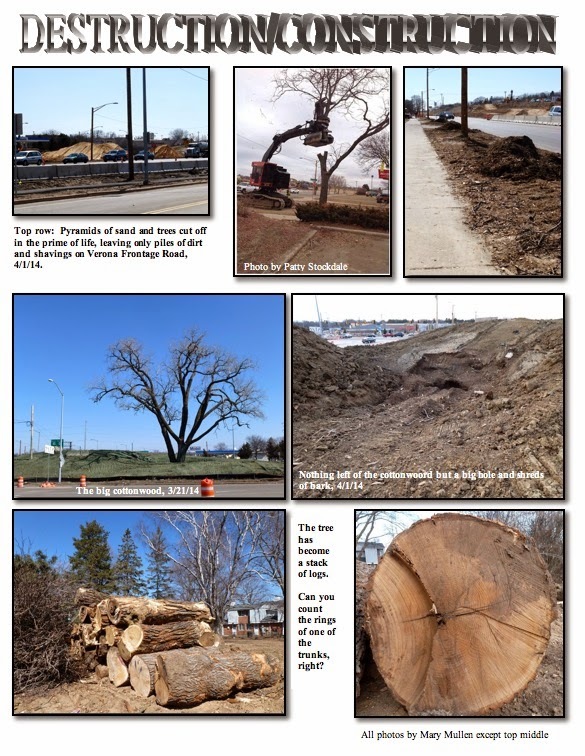 The big old cottonwood tree is gone, cut down on Election Day, April 1. This marks the end of an era, mourned by many who looked at the tree as a landmark, a welcoming sentinel, and a symbol of the past rural nature of this neighborhood. Where a tall spreading tree once served as a way station for small birds and a perch for hawks, all that’s left is the huge mound of fill dirt that was piled around it for the past two seasons and a hole in that mound where the trunk was ground away by big machines. A block east, at the site of the former Highlander Motel, lies a stack of big-diameter logs, the remains of the big trunks. 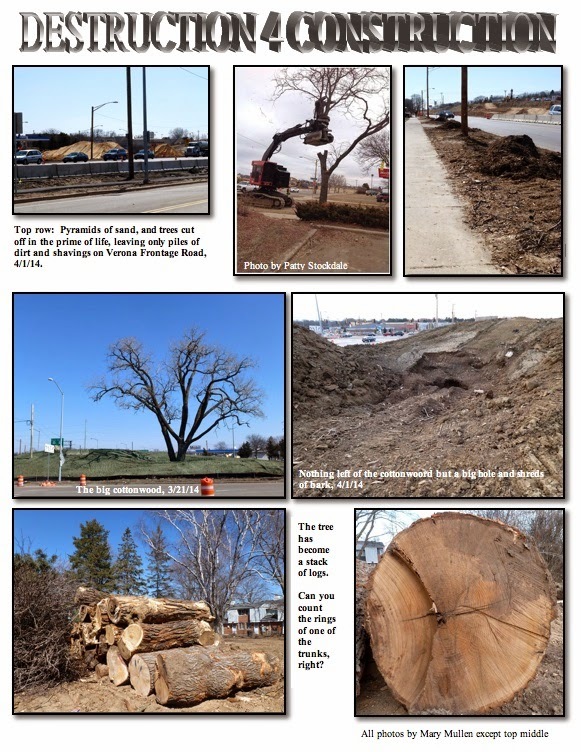 The demise of the tree was noted by long-time resident Mary Melvin of Windflower Way, who wrote this reflection. Was over by the highway and noticed our old Cottonwood Tree has left its post. We knew it wouldn’t last, but it was sort of a “Landmark” for years. I’ll miss seeing it. One more victory for the DOT. As I look at the project…I think….all of this construction is still not going to do much for the traffic on the Beltline. Cars and Trucks will roll on to the Beltline without stops, but once they are onto the Beltline it will be congestion again. Just wait a few more years and we will have roads over the Beltline. Probably four lanes going West on the top and four lanes going East on the bottom. Big City Traffic!!!! 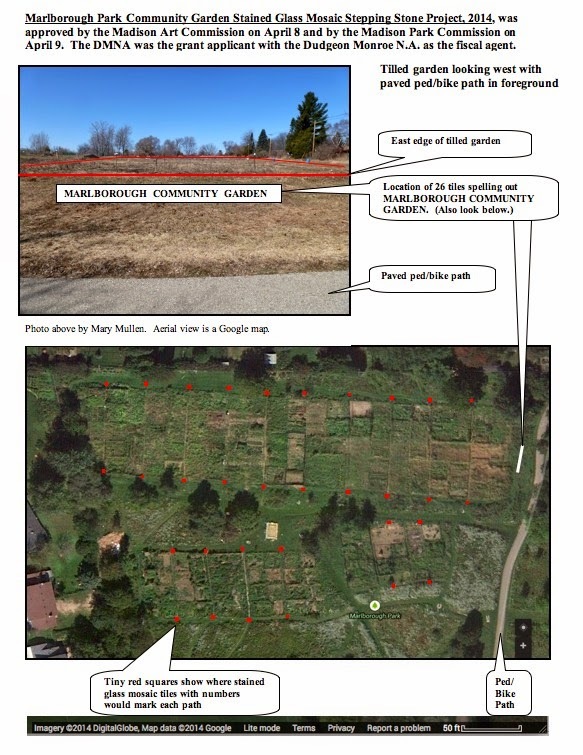 Garden plots are available in the tilled section of the Marlborough Community Garden. At the time plots were assigned to returning and newly registered gardeners on April 1, 11 plots were open. We are also looking for someone with a tractor and rototiller attachment to plow the community-tilled section of the garden. Please contact Micah if you know of someone who can do this. It’s almost a sure thing. 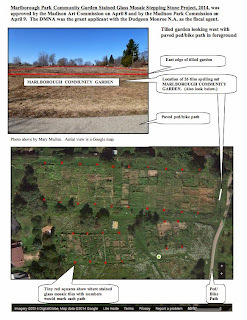 The Marlborough Community Garden Glass Mosaic Stepping Stone grant that the DMNA applied for March 31 got the nod for the full amount requested from the Madison Art Commission on Tuesday, April 8. Then on the 10th, the Madison Park Commission approved the project as well. All that remains is for the Madison City Council to approve the $918 grant to create 68 mosaic stepping stones. Passage is virtually assured. The full project will cost about $1,380 in cash outlay plus about 250 hours of volunteer time from gardeners and others making the stepping stones and setting them in the ground. The project has 3 parts. The main part is for numbered stepping stones to be placed at each end of each garden path. The numbers will help gardeners find their plots more easily at the beginning of the year and will help monitors know where they are in the garden as they check the maintenance of plots throughout the growing season. The second part is a line of stepping stones spelling out “Marlborough Community Garden.” This mosaic “sign” will be on the east end of the tilled garden adjacent to the bike path, easy to see for the many passersby, but far enough away that it won’t be wrecked by snow plowing. The third part is 10 additional stepping stones destined for the Head Start (Dane County Parent Council) and Allied Learning Center plots. 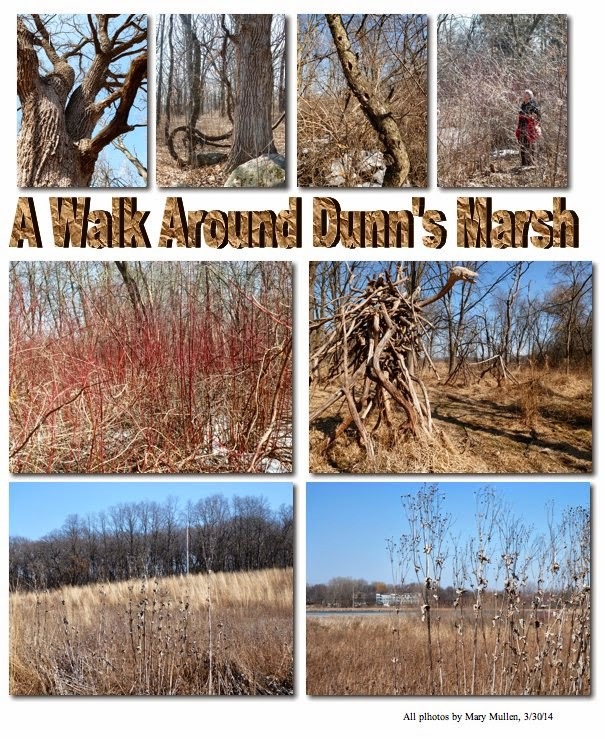 All the mosaics will be designed and created by gardeners and any other Dunn’s Marsh resident who wants to participate in the workshops that will be lead this summer by community artist Christina Kantor. Christina is experienced in working with people from our neighborhood since she lead the Allied kiosk mosaic stepping stone project last year. The DMNA was the applicant for this project with the other DMNA, Dudgeon Monroe Neighborhood Association, serving as the fiscal agent. An article in the Monona Herald-Independent, written by Julie Henning and posted April 10, features artist Elizabeth Doyle. Doyle is spearheading the mosaic project based on tracings made by Dunn’s Marsh Neighborhood kids that will grace the roundabout being constructed under Verona Road. Kids made the tracings of each other in March and April. The roundabout is just a big hole in the ground now over toward MacDonald’s but the mosaics are being designed at this very moment. Later this spring and into the summer, additional workshops will be held in our neighborhood for kids to apply the mosaic pieces to the designs. Here’s an excerpt from the article that explains the stage Doyle is involved in now. In one tracing, four girls lay down on two sheets of paper, each with an arm pointed towards the center of their heads. Doyle is working to incorporate images representing the elements of earth, wind, water, and fire—one element into each body. One design features a silhouette of 17-year-old Cory Morovits seated in his motorized wheelchair. Another design shows two boys from the Second Baptist Church connected in a two-fisted embrace. Doyle says she is enjoying the collaborative process and seeing the neighborhoods coming out from behind their typical boundaries. “It’s not just me collaborating on the design with the community, but the community is part of it. It was really important to the two neighborhood associations for the youth to be part of the art and to see that they have opportunities and are part of the neighborhood,” she said. I get more information in my NEIGHBORHOOD newsletter than I have in newspapers in the cities where I lived! To be fair, I couldn't read the German news so maybe the local news was great when I lived there. But have to say, I know so much of what is going on, the IMPORTANT stuff, that I would be worried ever leaving this area, I'm already spoiled and I haven't even been here a year! Next day two other neighbors sent their comments by e-mail. Jo Kelly’s kind words were, “Thank you for another informative newsletter!! 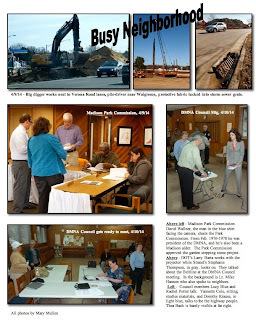 The pictures are awesome!” and Nathan Counley commented, “Thanks as always for your hard work putting this info together!” Back in the winter, another neighbor sent a generous donation to the DMNA along with a letter in which she also expressed appreciation for the photos in the newsletter. My aim in this newsletter is to share what I know or have learned, to let you know about activities in and out of the neighborhood that I think might be of interest, and to provide a visual and written record of our neighborhood and the activities of Council members and other residents who are working for the good of all. It’s nice to get that occasional appreciative feedback. The DMNA Social/Welcoming Committee will be promoting neighborhood-wide garage sales for a weekend in May. If you want to be on the list of places holding garage sales, contact Thea Bach, 274-7730 or 239-9810. The Social Committee will be picking a date soon. If you let Thea know you are interested, whe will give you details and get you on the list. Better yet, contact Thea and join the committee that will work on making these sales a success. Neighbors, put on your thinking caps and screw up your courage. Send me an e-mail right now saying you are interested in performing at this year’s neighborhood venue for Make Music Madison, June 21. Deadline for signing up is May 15. If you play or sing, doesn’t matter how good you are. Just do it! If you don’t play or sing, think of someone who does and get them to volunteer. The music, outdoors on the Prairie UU Society’s lawn, will be on Saturday, June 21, from 4 pm until 8 pm, or if enough sign up, maybe even from noon. Subject: [Bikies] Glass on SW Path! Night Riders went south on the SW Path this morning about 6 a.m. Just north of Lovell Ln we encountered broken glass, apparently broken purposely on the path. It looked like a whole sixpack! Two of the group tried to clear a way through the center of it with some cardboard that had been blowing around the area, but we left a lot of glass still on the path. Stick to the center line through it and check your tires for embedded glass when you get to your destination. Next I'll "Report a Problem" on Madison's Web site. Be careful out there! Seems to be an annual spring ritual in that section. While rolling along, it's generally effective to gingerly wipe each tire with a reinforced-palm riding glove right after passing through any area of glass, before it gets imbedded by riding on it more miles. Ahhh. If only this problem in this neighborhood was limited to spring. I commuted through there for several years, and I can assure you that it is a good idea to wipe your tires every time that you pass between Lovell and Verona Road. Winter spring summer or fall. It is always a problem. At the April 10 DMNA Council meeting, Lt. Mike Hanson of the Madison Police Department, West District, talked about law enforcement and heard neighbors’ concerns. Now that the weather is warming up, issues that were fairly dormant over the winter are popping up. Concerns include traffic issues and drug issues. Britta Parkway and Drive are experiencing illegal parking, cars are stopping and people blocking Britta Parkway which is now serving as the Beltline Frontage Road since the real Frontage Road is blocked off, and speeding is also a problem there. The next day, Lt. Hanson reported that officers are aware of the parking issues in the neighborhood and will be doing enforcement. In addition, neighbors complained about quickie drug deals are apparently taking place from car to car in several parts of the neighborhood, and drugs that are left and then picked up in the undeveloped areas of lower Allied Drive. Other complaints were about issues at the BP station, and boom cars. Officer Hanson emphasized that residents should call the police about any suspicious activity. Even if a drug deal is over so soon that police can’t get there, hope is not lost. Get as much information as you can to pass on to police - description of vehicles and their license plate numbers if possible. When you see crime happening, he encourages you to call a) 911, b) the non-emergency #255-2345, or 3) Crime Stoppers at 266-6014. Officer Hanson may be conducting “boombox” training sometime in the future. People who have taken the training can then report vehicles they observe that are playing noisy boombox music as they drive neighborhood streets. Trained boombox volunteers measure off 75 feet from their listening point and can report any vehicles they can hear at that distance. Those holes are getting very deep. One is along Verona Road very near the Beltline. The other is up closer to MacDonald’s. What are they all about? They are about getting pedestrians, bikes, and motor vehicles across Verona Road once all the construction is completed. In a recent discussion with construction supervisors I learned that the big hole near the Beltline intersection is the beginning of the ped/bike tunnel that will underlie Verona Road there. Rebar anchored in concrete is poking almost to ground level right now. But for now the big hole will collect excess stormwater runoff and keep it from running into Dunn’s Marsh. The place where cars now cross over to Home Depot will eventually be eliminated. Motorists wishing to get on the Beltline from the frontage road near Avalon Village and Walgreen’s will be able to turn right and head directly to the Beltline East. Those wishing to go to Home Depot or head out toward Verona, will have to use the roundabout. For an animation of the roundabout, go to <http://dotmedia.wi.gov/main/Play/abb8f14d05134dd6ad8fc5f4edc9754b > The new passage under Verona Road near Allied Drive and the Southwest Bike Commuter Path will also be eliminated when all the work is done. Meanwhile, the scene around this big intersection are changing everyday: first all the trees cut down (April 1), then the growing and shrinking piles of sand and dirt, always the mud and dust-filled streets, mountains of broken up concrete and ground up blacktop, and the trucks and assorted specialty machines that whine, grind, roar, and bang. Listened to in a positive way, the din creates a rough symphony of sound. No one likes silence like I do, but if I had to pick a favorite construction sound, it would be the pile driver that sends cymbal-like clangs that reverberate over the neighborhood. All we need is a saxophone player to riff around the rhythm of that gigantic beat. 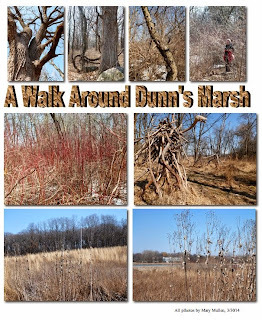 By the way, have you noticed that Dunn’s Marsh is getting a modicum of protection from all the dirty runoff created by this project? Look at the black fabric pinched into the storm water grates, especially visible on Britta Parkway. The fabric is supposed to filter out at least some of the sediment and larger trash generated by construction.